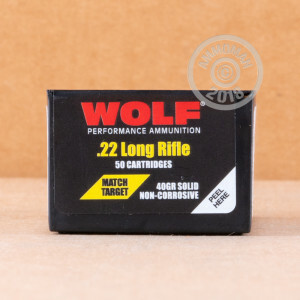 Wolf Match Target is high quality .22LR ammo that delivers superior accuracy without costing 50 cents a round. 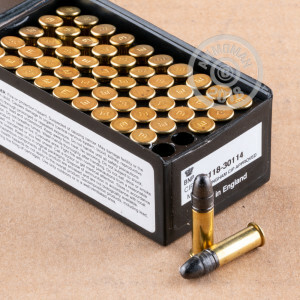 Packaged in a 50-round box, these rimfire cartridges use brass cases and a 40 grain coated lead round nose bullet. They are a great choice for rimfire rifles and pistols and work great for high-volume plinking or target practice and helping new shooters learn safe and effective firearms handling and basic marksmanship. Buy more than $99 worth of this ammo to qualify for FREE shipping direct to your door. It's AmmoMan.com's way of helping high volume shooters keep costs down and keep their guns firing! This is the best price/performance 22 lr ammo on the market. I shoot this ammo in everything from an Anchutz to a Savage Mark II TR. It is super accurate and reliable. It will shoot 1 small hole groups at 25 yds. I buy it by the case. I also shoot it in a Ruger Mark III Hunter which really likes it as well. I've never had a misfire.